▲Package: 1 x tactical vest. High Quality and Durable: made by high quality Nylon. Military Grade materials and stitching. Adjustable size: one size fit all. 17.5 X 44 inch (H x W)( adjustable waist, up to 44" waist). Fully adjustable in girth and length to a customized size through adjusting Velcro on sides. Multi-options bag: 3 Deluxe Adjustable ammo Mag Pouches plus 1 big accessory bag. 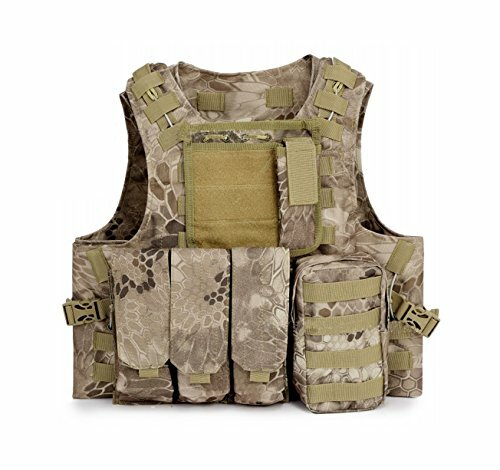 A Great Modular Tactical Vest for Airsoft and Paintball Battles. Color and Pattern: Tan Color, Python Pattern. Cool wild design for ourdoor battles. Light weight and Comfortable: Only weight 1.2 KG. Light and comfortable to wear. If you have any questions about this product by ESA Supplies, contact us by completing and submitting the form below. If you are looking for a specif part number, please include it with your message.